A rural agricultural centre near Orvieto, Allerona is immersed in the wood-covered hills of beech, ilex, and juniper. Its origins replicate those of nearby Orvieto, and there is no lack of architectural proofs from the period of the Roman Empire, with archaeological finds in the close proximities of the village, among which are some stretches of the ancient Cassia road (between Orvieto and Ficulle) and inscribed pillars relating to the new Traiana. Also visible are the ruins of the Castle of Meana, home of the homonymous barony, of a small fortress, known as "rudere dell'Armata" and the Bisenzio Tower, outpost of the Papal State. 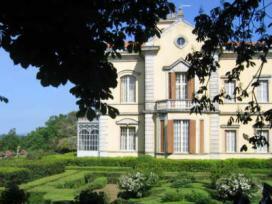 The Castle, destroyed by Carlo VIII in 1465, is worth a visit. Of it, just the walls and the doors of "the Sun and the Moon" remain. The Cahen villa, , made in art nouveau style, is in the Selva di Meana State Park and is also of interest, as well as the Castellana church, dating back to the XII century and restructured in the XIX century. A chance to discover the traditions, the gastronomy and the habits of these people, is offered every wednesday, when a market takes place in Allerona all during the day, and the fruits of this lands can be found on the custumary stalles.